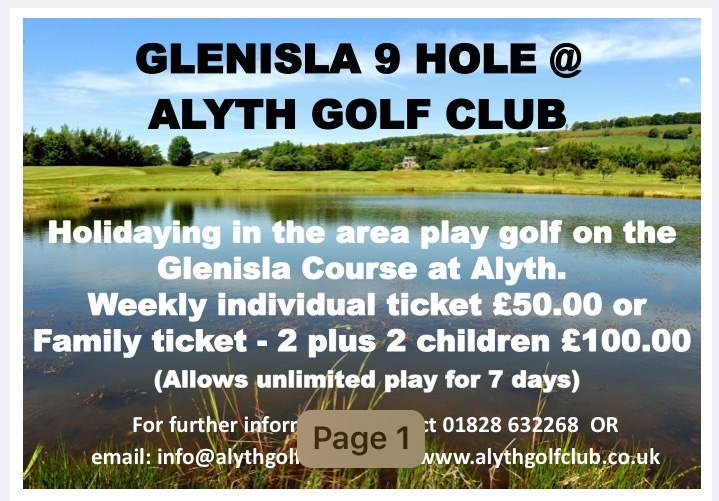 Visiting golfers are welcome to play at Alyth Golf Club and should book in advance; preferred tee times are between 10am to 11am and 3pm to 4pm. Discounted rates for parties and society bookings. Dress should be casual but neat. Denims, regardless of shape or colour, untidy trousers, vest style T-shirts, replica football shirts are not permitted on the course. There is a relaxation in relation to the wearing of tailored denims in the Clubhouse. Green Fees should be paid in full before play commences. All matches will be played off the yellow tees unless pre-arranged.. Visitors should be competent golfers and able to complete a round at Alyth in no more than 3 hours 30 minutes. Deposits are required with the booking form - £10 per head in respect of Green Fees. This will be deducted from the Green fee charges. Liability: Visitors, their vehicles and equipment are on Club property at their own risk..
7 covered bays, open to all. 25 balls for £1, tokens available from the Pro Shop or Bar.